4 Ways To Break Bad Cell Phone Habits: Time for a new C.E.L.L. (CUT, EVICT, LEAVE, and LIVE) Plan. Hello everyone and welcome back to the “UNderdogStuff® Writes” article series! I hope you are already rediscovering your special stuff in 2018. 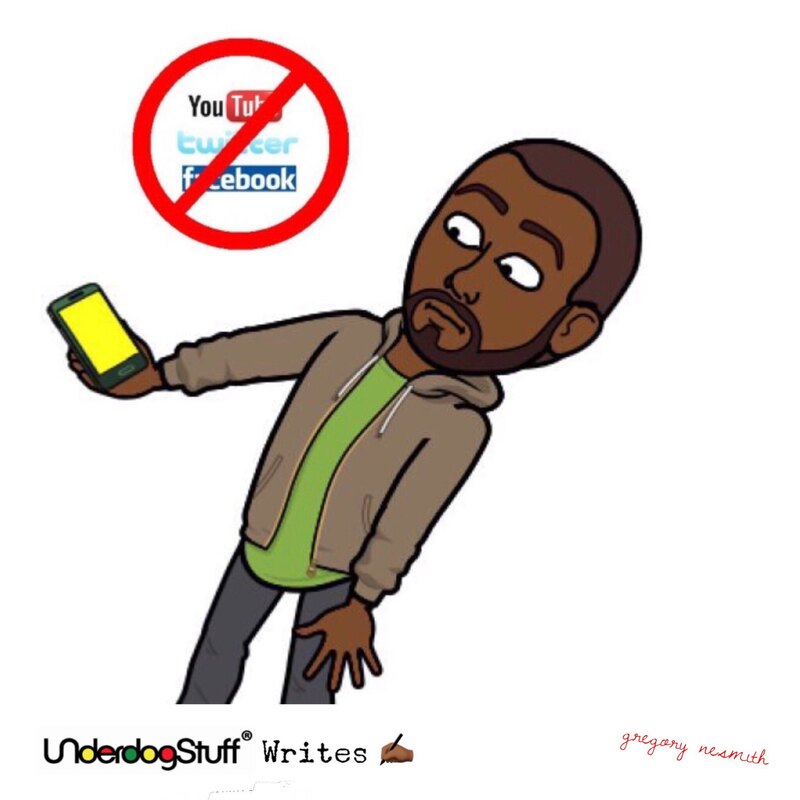 Recently on The Gregory Nesmith Show I talked about the growing trend of people taking social media and the internet off of their smartphone. Could you do that? I wondered if I could do that. I’ve been learning that going from UNderdog to champ requires letting go of my bad habits. What are you going to give up so you can achieve your great plans? I don’t think that I’m ready for the above extreme plan, but I do have a new C.E.L.L Plan for 2018. Time to CUT some apps! I don’t need four weather apps, seven dating apps, or 15 news apps. Don’t judge me! According to techcrunch.com the average American has around ninety apps on their cell phone. On a daily basis people use an average of nine apps and on a monthly basis they use an average of 30 apps. This means that on average we use less than half of the apps on our phone. I’m going to go through my phone and take all the apps off of it that I rarely use and no longer use. And while I’m in the cutting mood, I’m also going to cut down the number of notifications I have on. I don’t need to be alerted every time there's a new article posted on CNN or New York Times. This is going to help get rid of some distractions. Clutter is an UNderdog's enemy, and by cutting some apps and notifications my life will be less cluttered. My phone's no longer allowed in my bedroom. I’ve noticed I would wake up and reach for my cell phone instead of the person beside me in bed-- and that might be a problem. According to the Huffington Post, the results of a survey conducted by Bank of America on 1,000 people over the age of 18, showed around 71% of people either sleep with their phone in their bed or on their nightstand. 35% of people reach for their phone first thing in the morning... the runner up to this was coffee at 17%. From now on, I’m going to charge my phone overnight in the living room and leave it there till the morning. I’m choosing TLC instead of technology. The other place I’m going to EVICT my phone from is the bathroom. Whether sitting on the throne or taking a shower, do I really need my phone with me? I find that without the distraction of my phone in the bathroom I have the chance to think deeper and be more creative. According to Business Insider, 72% of people claim to come up with their best ideas in the shower. This is because in the shower we're free from distractions and can relax. We've a chance to be with just ourselves and our thoughts and this makes it easier to come up with creative ideas. When out and about I’m going to intentionally LEAVE my phone in my pocket more often. I was at a restaurant the other night with my parents and I wondered how it would be to leave my phone in my pocket while we ate dinner. No seat at the table for my phone allowed me to live in the moment. Maybe I’ll even try 'The Phone Stack' game to up the stakes of me reaching for my phone while having dinner with family or friends. Live, as in I’m at a LIVE event, is the fourth and final piece of the plan. Less online living and more offline living. Getting out to talk and interact with other people--you'd be amazed at what could come of it. Many UNderdogs I know have "finding a new job" on their 2018 wish list. People seem to always look for careers online, but if you get out and talk to people, you’ll have a better chance of finding that new job. PayScale.com has found that, on average, people spend 70% to 80% of their time looking for jobs online, but only 15% to 30% of people find jobs online. 70% to 85% of jobs are found through networking. The best way to find a career is to get off your phone and get out and talk with people. Go live, and not FB Live on your phone, but go live and in-person! C - Cut some apps and notifications. E - Evict your phone from certain rooms. L - Leave your phone in your pocket. L - Live offline instead of online. Part of choosing to be great is the opportunity to give things up, especially bad habits. That’s one of the ways to go from UNderdog to champ. I’m going to get started on my C.E.L.L Plan! What are you going to give up so you can get further down your path to greatness? And, as always, I’m going to leave you all with my favorite quote “UNderdogs, can’t nobody do it like you do it. Nobody.” -G.N. Originally published on Thrive Global and One Idea Away.